What’s not to love about Jane Eyre? Gothic and passionate, it features the ultimate hero – Mr Rochester. And that gives Charlotte a top idea: she’ll look for a new Mr Rochester for her lovely mum. So when Charlotte finds the ideal man, she can’t believe her luck. He’s dark, brooding and mysterious. He’s PERFECT. But this real-life romantic hero also turns out to be sarcastic and rude. Does Charlotte really want her mum marrying him? Perhaps it would have been better if Mr Rochester had stayed between the covers of Charlotte’s favourite novel…? If you couldn’t guess by the cover, this is a book aimed at a younger audience. I’m a bit fuzzy as to the exact age, because the heroine of the book, Charlotte (yes, named after the Brontë sister), is “very nearly fifteen” but to be fair, the plot and everything is so simple that I’m thinking it’s for a slightly younger audience than 14-year-olds. Or maybe it’s because when I was 14, I was busy reading Douglas Adams, Robert Jordan, Agatha Christie and Dean Koontz to be interested in this sort of book. The book is about what it says on the back (quoted above): Charlotte is a Jane Eyre addict who lives with her mum, an English teacher at Charlotte’s school. Charlotte decides one day that mum should find a Mr. Rochester, and attempts to find one. Lucky for her, the new school term brings a new French teacher – a Mr. Grant, who is sarcastic, dark and brooding. Definitely a good Rochester candidate! The book then follows her attempts at matchmaking for her mum, as well as her own attempts to impress Jack, the boy she fancies. And … that’s it. Simple as that. How she goes about it and whether or not she succeeds, Read And Find Out. The book starts off with a dedication: “To Woody – Rochester, Darcy and Clarkson rolled into one,” which would indicate the author is into classical literature and Top Gear. All three get frequent mentions (Rochester in particular, of course), and when Charlotte’s friend is trying to have a blokey conversation with Jack and talks about Bugatti Veyron, I can’t help but hear Jeremy Clarkson’s voice in my head. The writing is easy to read, especially as the book is printed in a big font as well, and I burst out giggling quite often. I like the bubbly tone and the sense of humour, even though I’m twice Charlotte’s age! The characters aren’t exactly detailed, because while we might get descriptions of Charlotte’s over-sized nose and her numerous attempts at trying to find the right adjective to describe Jack’s green eyes (“broccoli” just isn’t that romantic, you know? ), we don’t exactly get to know them as people terribly well. Not that they’re completely void of personalities, just … they’re a bit flat. Just there as a backdrop, to give Charlotte something to react to. There is also not a lot of character progression. Charlotte is the same person as she was before, because the only real transformation is that she’s perhaps a fraction less obsessed with Jane Eyre at the end. A fraction. Maybe it’s because it’s not exactly a book aimed at my age group, so I’m over-complicating it, but still. Rain. There was no way Charlotte was going out in that. She stared wistfully at the big, fat drops splattering wetly against her bedroom window. /…/ She sighed, impatiently swiping her cuff across the misted glass. It echoes the opening of Jane Eyre beautifully! She takes a few swipes at Jane Austen in the course of the book as well, and it’s like being back at high school again. I really feel like a teenager when I can’t help but let out a gleeful giggle ever so often. The end was very predictable and there were many points where I’d want to hit Charlotte over the head with “The Book” for being so stupid not to realise certain things that were, realistically, fairly obvious. Still, all in all, I thought the book was utterly delightful. I could squeee along with Charlotte over Mr. Rochester and Jane Eyre. If I had a daughter, I’d strongly suggest she reads this book. And Jane Eyre. But alas, as I lack a mini-me and have no current plans to multiply, I’ll have to settle for blogging about it instead. EDIT: Woops, I forgot something very important! The book is VERY BRITISH. As in, if I hadn’t lived here for the past six years, I wouldn’t have understood half of the references or just words or phrases in general. So yes, the use of language is exceedingly British. Nowt wrong with that, though, just thought I’d mention it! 5 out of 5 grumpy English teachers! 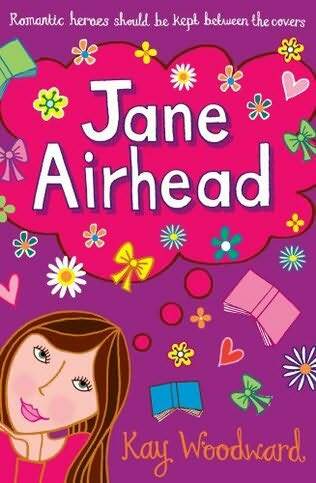 5 Responses to "Jane Airhead by Kay Woodward (2009)"
I might recommend this to my younger sister (handing her Jane Eyre right after). Or I might link my former IB coordinator to this, the wonderful woman who first made me read JE. I read Jane Eyre for the first time when I was 13. And I was still pretty obsessed at 14 so I think I can relate. Viktor: It might actually be better to have an understanding of JE first, because otherwise it might get a bit boring – like a joke and you’re not in on it. There are lots of references to JE and without knowledge of it, it’s just going to be a bit puzzling. I can certainly relate to characters. When I first read Jane Eyre as a teenager I saw myself very much like Jane and hoped to find my Mr. Rochester. Lovely review – I can see how it would be great for young readers,and hopefully encourage them to read more.